A fellow teacher, landscape designer, writer and mentor, Jan Johnsen, once shared with me how she would bring her favorite books to the classroom to expose her students to inspirational garden literature. I now do the same with my students and thought it would be fun to share some with you periodically too. I’ll be honest, when I bought this book in 2016 (about a year after it’s publication) I placed it on my shelf and didn’t look at it again until Kelly Norris and I taught a workshop together at the Greater Des Moines Botanical Garden over a year ago. We were using some key principles from this book, so I sat down and read it from front to back. I’ve been enamoured ever since and now teach the designed plant community concepts in my advanced landscape design studio. 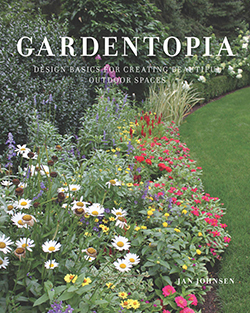 Yes, the same Jan Johnsen I mentioned above wrote this fun, new garden design book. I had the honor to read this book before publication and was thrilled to formally endorse it. It’s a wonderful resource filled with tons of garden design ideas. These concepts range from traditional principles with a new twist, to highly detailed thoughts freshly spun for even experienced designers. Fun photos and short text descriptions keep you engaged and wanting more. My students write about a significant landscape designer each spring and as I read one paper on Gertrude Jekyll it made me realize I still hadn’t explored any of her writing (yikes!). This is one of Jekyll’s most popular books reprinted in 2001. It includes a lovely preface by Richard Bisgrove that dispels and highlights some fun facts before diving full force into Jekyll’s colorful writing. If you’re looking for beautiful plant combinations during certain seasons, you’ll find those here. Let me know what garden books you’re currently reading and enjoy. We would all love adding to our collection!